Artificial Turf for Scottsdale Lawns: Is it Actually Better than the Real Thing? People around the world are slowly replacing natural grass in their lawns, sports fields, school grounds and playgrounds with artificial turf due to its positive environmental and cost benefits. Here in the U.S., local governments are doing everything they can to entice residents and commercial business owners to make the switch from natural to artificial lawns. A great example of this is the local government of Scottsdale, AZ, where artificial turf is fast becoming a trend due to the tax rebates available for residents and business owners who have made the switch. Still, there are some who remain unconvinced of the awesome advantages of artificial turf over natural lawn. At first glance, you might dismiss artificial turf as an unnecessary expense since the initial outlay cost is on the high side. However, the benefits of artificial lawn over natural lawn should be more than enough to recover every penny you spend in getting it installed – with significant interest. While you might argue that there’s no comparing the smell of a freshly mown lawn nor will there be any equal to the soft, cool touch of natural grass, there’s no denying that the new generation artificial turf can still astound onlookers with its perpetually verdant appearance, even in the middle of a hot summer. Residences and commercial areas in Scottsdale know for a fact how hard it is to cultivate and maintain a lush looking yard or lawn when the hot Arizona temperature starts turning natural grass into brown crisp. Most are then forced to use up thousands of liters of water just to keep natural grass alive, or at least retain some of its green color. Yet, even then you can still see ugly patches of brown where the heat wins the battle. This hardly looks pleasing at all. On the other hand, artificial turf requires very low maintenance (sometimes, none at all). It does not need to be watered, mowed, fertilized, or sprayed with biocides/insecticides as opposed to natural grass. 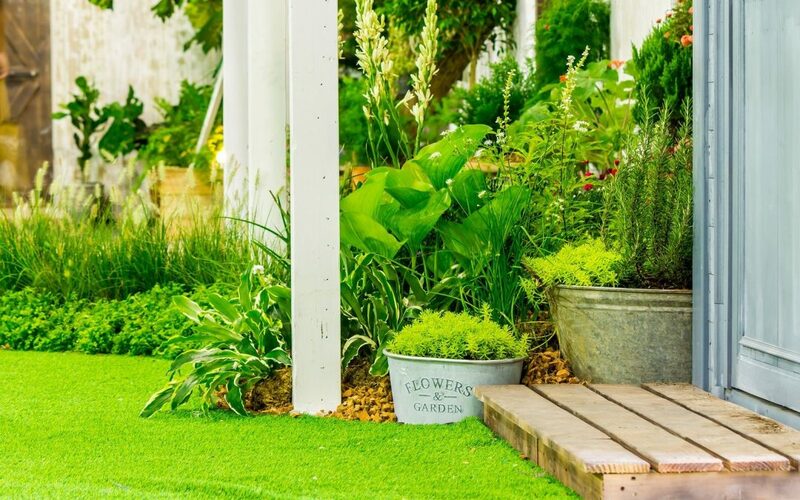 Artificial turf frees you from these common gardening tasks, and allows you to save money you would otherwise spend for gardening materials, fertilizers and tools. Artificial turf only requires an occasional water spray to keep it clean and beautiful. Furthermore, grass clippings have been hailed by the U.S. Environmental Protection Agency (EPA) as the third largest component in most landfills. Thus, not only will you spend considerable amount of time maintaining and cutting the natural grass to acceptable lengths, you are also largely contributing to the overall solid waste in the state. In addition, artificial turf only starts to ‘deteriorate’ after almost a decade. Compared to natural grass whose look primarily depends on the changing of seasons, artificial turf gives you a beautiful and virtually maintenance-free lawn for a decade. If you compute the total costs of artificial turf over natural grass, the only expenditure you’ll have for the synthetic turf is the initial outlay while the sum total of maintaining natural grass can be staggering. Moreover, the environmental impact of using artificial turf is undeniable. Using synthetic grass reduces water consumption, prevents harmful disease carrying insects from living in your lawn, and it does not require the use of chemical fertilizers and insecticides that can polluting the soil and bodies of water. Whatever way you look at it, artificial turf is actually far more cost effective than natural grass. It can also be more pleasant-looking, especially in an area as hot as Scottsdale. Contact your local professional landscape services to know more on both artificial and natural grass before you decide which one is best for your lawn. Home » Artificial Turf for Scottsdale Lawns: Is it Actually Better than the Real Thing?